Text: Origins. This hymn was one of only nine hymns (or devotional poems) published by Samuel Crossman (1623–1684) in The Young Man’s Meditation (1664 | Fig. 1), a small collection that was published together with The Young Man’s Monitor, a work “intended for the endearing of God, and the bringing up [of] a good report upon piety and virtue in the hearts and hearing of young persons.” The title page of The Young Man’s Meditation includes a quote from George Herbert’s The Temple (“A verse my find him whom a sermon flies, and turn delight into a sacrifice”), a collection that was a direct influence on this text. Crossman published this text the year before his ordination as into the Church of England and his appointment as curate of St. Gregory’s and St. Peter’s in Sudbury. The original publication is without music, in seven stanzas of eight lines, and headed with Galatians 6:14 (“God forbid that I should glory, save in the cross of our Lord Jesus Christ,” KJV). Fig. 1. The Young Man’s Meditation (1664). Text: Analysis. The theme of the hymn is the unprecedented love of Christ in his sacrifice on the cross. Gracia Grindal, in a thoughtful analysis for The Hymn, vol. 38, no. 2 (April 1987: HathiTrust), summarized the perspective of the text as “that of a naive bystander at the events of Holy Week, during the trial and crucifixion of Jesus. The onlooker, befuddled by the events unfolding before his or her eyes, is able to express the obvious contradiction of the death of Jesus: an event in which a good man dies for a thief” (p. 30). The last part of her summary is somewhat of an understatement, as the narrator of the text recognizes the crucified one not just as a good man, but as a divine Lord, King, and Friend. Some of the events in Christ’s life described in this text are the Incarnation (stanza 2), Palm Sunday (stanza 3), the crowd calling for his crucifixion (stanza 3), his miracles (stanza 4), the trade of Christ for Barabbas (stanza 5), and his placement in the tomb (stanza 6). Underlying this text is a rich connection to a pair of hymns by Crossman’s poetic predecessor, George Herbert. 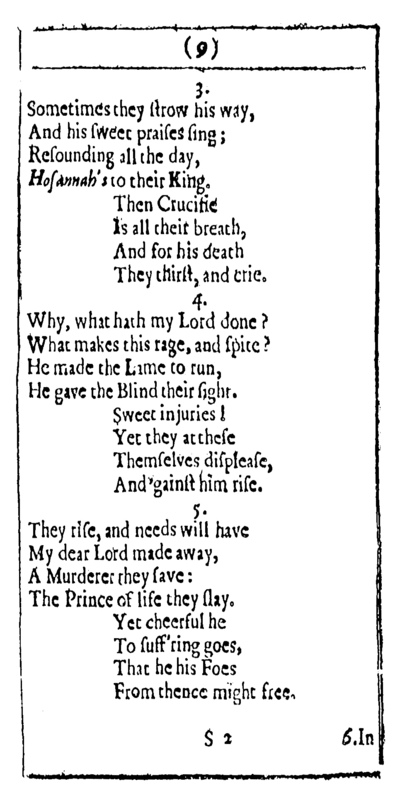 Crossman’s opening line, “My song is love unknown,” recalls Herbert’s poem “Love unknown” in which the narrator describes the faults of his heart, but takes comfort in knowing, “all my scores were by another paid, who took the debt upon him.” The other connections to Herbert are in his poem “The Sacrifice.” Whereas Crossman’s text is from the perspective of an observer, Herbert’s text is from the perspective of Christ himself. 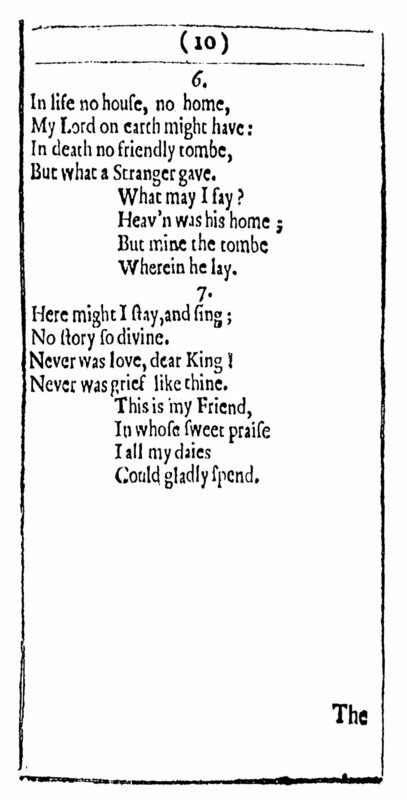 The clearest connection between the texts is in Herbert’s line, “Never ever grief like mine,” which was quoted by Crossman with a shift of person as “Never was grief like thine” (stanza 7). Herbert also referenced the crowds who called for the crucifixion (Herbert st. 25 / Crossman st. 3), and called to have him taken away (Herbert st. 26 / Crossman st. 5), and the chose a murderer over the Prince of Life (or Prince of Peace, Herbert sts. 29-30 / Crossman st. 5). 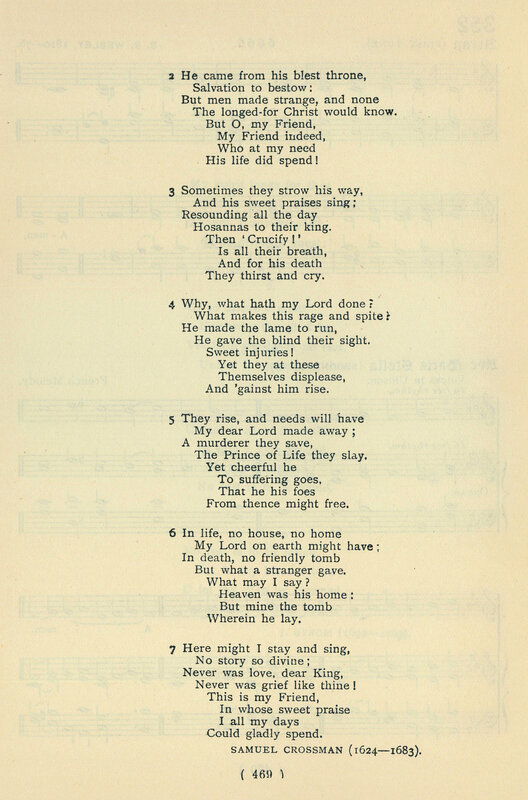 The renewed popularity of the hymn in the last 150+ years is generally credited to Daniel Sedgwick’s reprint of The Young Man’s Meditation in 1863 (WorldCat), after which the hymn was adopted into the Anglican Hymn Book (1868), then many other collections. Fig. 2. The Public School Hymn Book (London: Novello, 1919). Raymond Glover, “My song is love unknown,” The Hymnal 1982 Companion, vol. 3B (NY: Church Hymnal Corporation, 1994), no. 458. Christopher Idle, “My song is love unknown,” Exploring Praise, vol. 1 (Darlington: Praise Trust, 2006), no. 403. Paul Westermeyer, “My song is love unknown,” Hymnal Companion to Evangelical Lutheran Worship (Minneapolis: Augsburg Fortress, 2010), no. 343.